Heart were cut with the Nestabilities cutting 2 of the scalloped and one of the plain heart shapes. 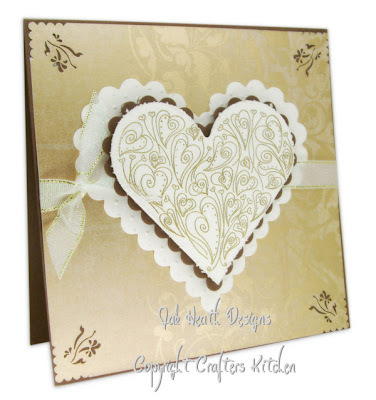 The plain heart was then stamped with a heart stamp made by Impression Obsession and heart embossed with ranger gold fine detail embossing powder and heat set then distressed the edges of the heart. The larger scalloped heart was embossed using the Swiss dots cuttlebug folder. Another stunning card Jak, love it. Absolutely wonderful Jak, i love it and i think the corner punch you have used has just finished it off perfectly. Wow, this is absolutely stunning, Jak. Yes, it is very elegant! I so love this card. You never cease to amaze me. Such a beautiful card, Jak. What a beautiful card Jak. I have a question. Who makes that 3 in 1 corner punch? I need to have this.